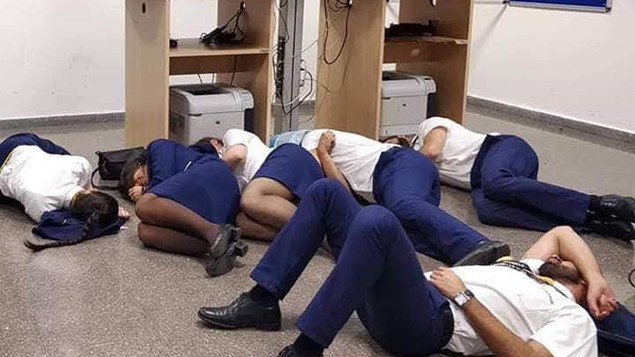 Six Ryanair cabin crew were dismissed by the airline this week for “breach of trust” after a photograph was circulated on social media showing the employees apparently asleep on the floor at an airport crew room. The crew had been grounded in Malaga on 13 October by storms that prevented their flight’s departure to Porto. The airline claimed no hotels were available for them because of the Hispanic Day national holiday. Ryanair claimed that its workers were in the crew room for “a short period of time” before being moved to a VIP lounge. The six employees returned to Porto the next day, and did not work on the flight back. On 17 October the airline released a video on Twitter that it said demonstrated that the photo (above) of the crew asleep was fake. Rest periods for aircrew are governed by international Flight Time Regulations. However, it is common for airlines and crew to enter a dispute over the rest required and facilities for employees. Portuguese airline union SNPVAC challenged Ryanair’s summary of events, claiming that 24 crew members were placed in a room between 01.30 and 06.00 “without minimum rest facilities”. This was “behaviour which damaged their employer’s reputation and caused an irreparable breach of trust with these six persons”. The use of social media to pursue a grievance against a company is an increasing trend. Sue Andrews, a fellow of the Chartered Institute of Personnel and Development and an HR director, said that it was important that employers were clear about how they could protect themselves from reputational damage. She recognised that Ryanair’s recent problems with staff over pay and conditions had damaged the airline’s reputation but added: “Staff taking to social media to publicise a grievance is an increasing problem for employers. Stories become sensationalised and the genuine facts of a situation are often lost, while company reputations can be irrevocably damaged.